5つ星のうち4.0What's a few letters here and there? Simon Horobin is professor of English Language and Literature at Magdalen College, Oxford. His latest book, "Does Spelling Matter? ", whilst aimed at the interested non-specialist, presents a scholarly history of the forms of written English over the ages. There are times, especially in the early parts of the book, where it is perhaps a little too scholarly, offering heavy going for the lay reader. 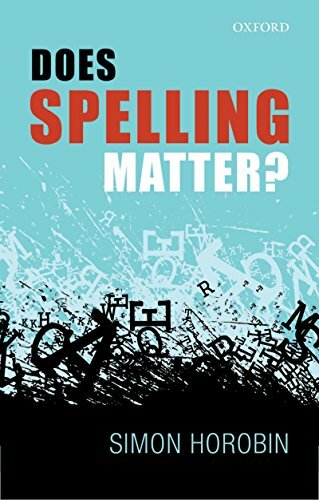 For those able to stay the course, though, the book presents much that is fascinating about the English language and its idiosyncrasies of spelling, debunking countless popularly upheld myths along the way. 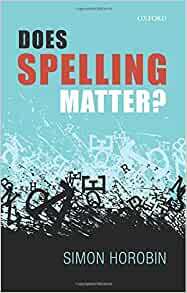 It stands as a competitor to David Crystal's "Spell It Out: The Singular Story of English Spelling", which made it into the best-seller lists when it was released last year. I do not expect this latest look at the history, make-up and potential future of English spelling to do as well as its predecessor in the popularity charts; Prof Horobin's erudition and academic rigour standing somewhat at odds with the more popularising style of Prof Crystal. Lovers of words, their form and their function, will nevertheless find much to savour between its covers. The book's eight chapters chronicle the history of our written language from its earliest roots and origins in Anglo-Saxon England, through its re-emergence from suppression by the invaders' Norman French in the late Middle Ages, its renaissance during the Early Modern period of the sixteenth to eighteenth centuries and into the great definitive spelling age of the modern dictionary-ruled period. It closes with an examination of the impact of additional outside pressures on our spelling system, such as the spread of American spelling reforms, as well as the apparent suspension of correct spelling habits witnessed in the modern era of electronic communication. Each chapter details the attempts over the centuries that have been made to rationalise or simplify our English orthography. While some of these revisions have indeed been implemented and put into practice, remaining with us in some form today, the vast majority -- mercifully -- were abandoned never to see the light of day, or else fell rapidly by the way-side. Each chapter is painstakingly detailed, with the whole making for a fascinating story -- albeit one that is seemingly of a history of well-meaning cack-handedness in the way English has been treated over the years. One progression which the author exposes in the book but doesn't really put under the microscope (thus, to my mind, failing to take it to its logical conclusion) is the steady shift in guardianship of standardised English orthography which has occurred over time. The earliest standardised form of written English in Anglo-Saxon times was very much within the domain of court scribes and monastic clerics; with the rising influence of major seats of learning and scholarship in the late Middle Ages, however, this yoke was taken up by academics, keen to establish and reflect (a largely bogus, as it happens) etymology for our language in classical Latin and Greek. The introduction of the printing press shifted the onus for establishing and maintaining the way words were represented on paper to the compositors of the printing houses. Simon Horobin presents wide-ranging evidence for the fact that even the most revered authors of English literature and scientific endeavour of those times rarely used consistent or even correct spellings in their letters, diaries, notebooks or even manuscript writings. 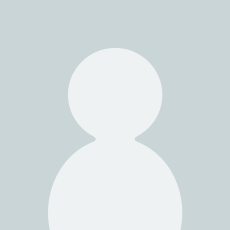 It was left to those charged with the business of producing the final published works to maintain and preserve the consistency of presentation of material destined for any wider audience. In part, this was to ensure that their wares were as accessible to as wide a buying public as possible. Adhering to standard forms also facilitated the faster and more efficient preparation of the printing blocks, ensuring that the work was completed more quickly. Over the last century or so, renewed drives for spelling reform have largely come from educators and politicians concerned with the economic cost that the inconsistencies in the way English spelling works supposedly imposes on its teaching. Few, if any, of the reforms suggested from this quarter have ever found sufficient support for their introduction, whilst many of those that have been tried have been abandoned as hopelessly unsuccessful. Today, the global reach of most written English publications, particularly with the rise of the internet and other electronic means of transmission, together with concomitant perversions of established standards through widespread exposure to other English-based standards -- such as Webster's simplified American standard spellings -- leads many to fear for the inevitable acceptance of a steady bastardisation of our traditional spellings. Words such as programme, dialogue, catalogue and even pyjamas would seem to be particularly at risk in this regard, even though resistance to new renderings such as "color" remains high. Oddly, discussion of this on-going modern shift is side-stepped in Horobin's final chapter, where he flags up (and then dismisses almost as specious) the increased use of abbreviations and contractions prevalent in text messaging and on-line chat as potential threats to the continuance of traditional spelling forms. To my mind, though, the greatest step ever taken in the democratisation of the written word has occurred through the rise of internet self-publishing with its absence of the traditional guardians of orthography and style, in the form of publishers' intermediary agents (be these the compositors and their apprentices of yore, or the latter day multi-tiered editors). For the first time almost since the dawn of the written English word, writers are fully free now to present and distribute their words to the public in whatever form and shape they wish. It is perhaps too early to say whether public approbation and ridicule for writings which present their authors as ignorant of "correct" English spellings will regulate or restrict the rate and direction of change which results and propagates from these sources. I am nevertheless surprised that Horobin does not even mention or comment upon the phenomenon. Those concerned about this issue will have to draw what succour they can from the book's final chapter summary of the general resistance demonstrated by all populations to any tinkering (official or otherwise) with spelling systems in general, which seems to suggest that change from this quarter, if it occurs at all, will be gradual and ultimately only small in scale. Those buying the book in order to obtain a definitive answer to the question posed in its title may be disappointed to learn that they will need to wait until almost the final pages of the book before finding this addressed. They may be even more disappointed at the way the author hedges his bets somewhat in his conclusion: whilst suggesting that "proper spelling" probably isn't something that people should get as agitated about as they do, he shows it is clearly an issue about which people feel very strongly, concluding that to most, at least, spelling matters very dearly. Not only do people seem to feel the need to defend the investment which they themselves made in learning to read and write, their inherited spelling system also provides a clear and dearly held association with national or even personal identity. Moreover (and more importantly) spelling carries a wealth of information regarding the meaning and the sources of our words which assists greatly both in our assimilation of meaning as we read, and in our ability to determine the sense of words hitherto unfamiliar to us without the need for recourse to a dictionary. It is enormously helpful to a learner that "century", for example, through its similarity of spelling, indicates its connectedness to "cent", whilst "sentience", having a different spelling in spite of its identical opening sound, does not. Our current spelling system, for all its shortcomings, carries a rich and varied heritage, which most of us would not lightly wish to see lost. All of that said, however, the past history of English spelling, together with the nature of English as a living language which constantly changes and evolves, not only in the spelling but also in the meaning and pronunciation of its words, should be taken as an indicator that spelling rules are nothing like as fixed and immutable as many view them to be. And any book that cites the grate and lerned (sic) Molesworth in its sources has be worth having.